What is mastoiditis? Is it serious? What tests diagnose the cause of mastoiditis? What home treatments relieve pain and other symptoms of mastoiditis? When does mastoiditis need to be treated with antibiotics or surgery? Mastoiditis (acute and chronic) is a bacterial infection of the mastoid cells in the mastoid bone, which is located just behind the ear. Mastoiditis can become serious if the infection spreads outside the mastoid bone. The most common cause of mastoiditis is an untreated inner ear infection (otitis media). Mastoiditis cannot be treated at home. Medical treatment with antibiotics, and in some people surgery, is necessary as the infection can spread and cause serious complications. Using over-the-counter (OTC) pain relievers and fever reducers to reduce pain. Placing a warm compress on the ear. Treatment for mastoiditis is with antibiotics. If antibiotics alone do not cure the infection, surgery may be needed to drain the middle ear or to remove part of the infected mastoid bone. The main way to prevent mastoiditis is to prevent ear infections (acute otitis media) or by treating an ear infection right away. Mastoiditis can be cured if treated with antibiotics right away. It may come back periodically (recur) in some individuals. If infection spreads, serious complication can arise including hearing loss, bone infection, blood clots, brain abscess, and meningitis. The mastoid bone is the back part of the temporal bone of the skull located just behind the inner ear. Mastoiditis is infection of the mastoid bone. The mastoid bone is made up of a honeycomb-like structure, which is full of mastoid air cells. The mastoid air cells can become infected or inflamed, often as a result of an inner ear infection (otitis media). If infection spreads outside the mastoid air cells into the mastoid bone (coalescent mastoiditis), serious health problems can arise. 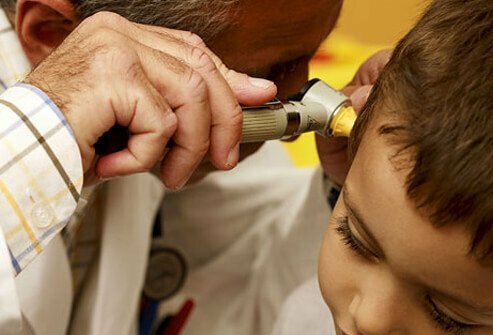 Mastoiditis is more common in children, but it can affect adults as well. A middle ear infection is inflammation of the middle ear, which usually is caused by an infection. Signs and symptoms of a middle ear infection are ear pain, fever, temporary hearing loss, and a feeling of fullness in the ear. The most common cause of mastoiditis is an untreated inner ear infection (acute otitis media). Lumbar puncture or "spinal tap"
Mastoiditis cannot be treated at home. It requires medical treatment as the infection can spread and cause serious complications. Most of the home treatments are aimed at reducing symptoms of an ear infection, which is the most common cause of mastoiditis. Wear earplugs when swimming or showering to keep water out of the ears and keep an ear infection from worsening. Over-the-counter (OTC) pain relievers and fever reducers such as acetaminophen (Tylenol) or ibuprofen (Advil, Motrin) may be taken for pain and inflammation. Do not give aspirin to children or teenagers as it has been linked with Reye’s syndrome, a rare but serious disease. A warm compress held over the ear may help relieve some pain. Avoid air travel if possible, as flying may aggravate ear pain. You cannot treat mastoiditis at home. Early diagnosis and treatment with antibiotics is needed to avoid complications. In some cases, intravenous (IV) antibiotics in a hospital may be required. If antibiotics alone do not cure the infection, surgery may be needed. A myringotomy may be performed to drain the middle ear, and in more serious cases a mastoidectomy may be needed to remove part of the infected mastoid bone. If mastoiditis is treated promptly with antibiotics, it can often be cured. In some people, the infection comes back and another course of antibiotics is required. The best way to prevent mastoiditis is to prevent ear infections (otitis media) and treat any ear infection you have with antibiotic therapy. Wash hands frequently to prevent the spread of cold and flu viruses. Keep children away from secondhand smoke. Studies have shown children who are around smokers get more ear infections than children not exposed to smoke. Be sure your child gets the flu vaccine yearly. Vaccinated children get fewer ear infections than non-vaccinated children. Limit your child's exposure to other children who have a cold or the flu. Devan, PP. "Mastoiditis." Medscape. Updated Jan 09, 2017. Lawrence, RL, MD., et al. "Chronic otitis media, cholesteatoma, and mastoiditis in adults." UpToDate. Updated: Dec 2017. National Health Service. "Ear Infections in Children." Updated: May 12, 2017. Please share your experience with mastoiditis. What were your symptoms of mastoiditis? What was the cause of your mastoiditis? How was your mastoiditis treated? Meningitis, inflammation of the meninges, symptoms and signs include neck stiffness, headache, and fever. There are five types of meningitis: viral, bacterial, fungal, parasitic, and noninfectious. What is meningitis and what causes it? Take our Meningitis Quiz to learn the causes, symptoms, treatments, and complications of this potentially life-threatening disease. Stellate necrotic areas on the legs of a child with meningococcemia. See a picture of Meningococcemia and learn more about the health topic.